Arizona LLC law requires that the Articles of Organization of an Arizona LLC contain the name(s) and address(es) of all members of member managed LLCs and the name(s) and address(es) of all managers and members who own 20% or more of the capital or profits of the LLC. If you want to form an Arizona LLC without having your name and address stated in the Articles of Organization then you need to purchase my Gold LLC package for $997. Our Gold LLC package provides confidentiality for the ultimate owner because we prepare a confidential trust to be the member of the LLC. If you want to form a new Arizona limited liability company the first thing you need to do is determine if your desired name is available. The good news is that the Arizona Corporation Commission has an online name check database that will tell you if a desired name is available or taken. In this video we will demonstrate and show you how to how to do an Arizona business name search to find a name for a new LLC. If the name is available we will also show you how to reserve the name for 120 days. Warning: People sometimes mistakenly search for arizona secretary of state business entity search when they want to know if a name is available for an Arizona LLC or corporation. Do not search the Arizona Secretary of State’s website for LLC or corporation names because it is the Arizona Corporation Commission that determines is a name is available for an Arizona LLC or corporation. For more videos on forming and operating Arizona limited liability companies and how to use the Arizona Corporation Commission’s forms and online services see the KEYTLaw Youtube channel. Please click on the subscribe icon and the bell symbol to the right of the subscribe icon to get a notice when we upload a new video. See the contents of my Bronze ($397), Silver ($597) and Gold ($997) LLC formation packages. To buy your LLC complete my online LLC formation questionnaire or call me. If you have questions about forming an Arizona LLC call me, Richard Keyt, at 480-664-7478. I don’t charge to answer questions about LLCs. Question: I intend to buy a commercial real estate property. Should I form a corporation to own the real estate? Answer: No. Nope. Absolutely not. No way. Negative. Are you kidding? Ix nay. Uh-uh. Nah. Not on your life. No way. No way José. Ixnay. I hope you don’t misunderstand my position. See also “The Perils of Holding Real Estate in a Corporation,” which discusses the federal income tax reasons it is a bad idea for a corporation to own real estate. My son Richard C. Keyt and I formed 448 Arizona limited liability companies in 2016, which exceeds the 414 LLCs we formed in 2015. Sixteen LLCs were IRA LLCs in which IRA owners used IRA funds to make self-directed investments in real estate or other assets. Our best year was 2012 when we formed 530 Arizona LLCs. I formed my first LLC in October of 1992 the day Arizona’s LLC law became effective. Since I started counting in 2002 I have formed 5,321 Arizona LLCs. 2/19/2016 – HB2447 – PUBLICATION OR POSTING ON ACC WEBSITE — HB2447, passed last legislative session, provides the public with options of publication in a newspaper or posting by the ACC if the known place of business is located in Maricopa County or Pima County. The ACC approval correspondence for documents subject to the bill will inform the submitter about the options. The database mandated by the revision to A.R.S. Section 10-130 is actually a new page on our website, and as of January 1, 2017 there will be a prominent link to it on the eCorp home page. Approved documents subject to the bill will automatically be posted after January 1, 2017, and the customer will not need to interact further with the ACC. There is no fee associated with the posting at this time. A lot of lawyers and document preparers form Arizona limited liability companies including yours truly. My LLC formation services, however, include many features nobody else offers. One of my unique services is the Arizona LLC Alert System, which is a series of email messages I send to people who purchase my Silver and Gold LLC packages. Get federal employer ID number. Open bank account in name of the LLC. Arrange for all members to sign the Operating Agreement. Consult with tax accountant about which of the four ways an LLC can be taxed is best for the owner(s) of the LLC. File IRS Form 8832 or 2553 if recommended by the LLC’s tax advisor. Transfer land to the LLC by recording a deed (for LLCs that are to own real estate). Get a dba or trade name from the Arizona Secretary of State. Another unique service I give purchasers of Silver and Gold LLCs is access to my 170 page ebook called the “Arizona LLC Operations Manual.” Chapter 3 of the Operations Manual is a checklist of 34 tasks the LLC should accomplish in its first 75 days after being formed. To help members of new LLCs I form accomplish these 34 tasks I created the Arizona LLC Alert System. It is a series of email messages I send to the members of Silver and Gold LLCs I form. These messages remind people to accomplish important LLC post formation tasks. The Arizona LLC Alert System consists of 50 email message alerts. See the entire list of the 50 Alert emails now included in the Alert System. The Alert System sends members a mobile friendly email message that links to a mobile friendly web page where the actual content of the alert is displayed. Our LLC members love getting these informative alerts. The following is a list of other unique LLC formation services I provide for all purchasers of my Silver and Gold LLC formation packages. Two different Operating Agreements – a 30 page Operating Agreement for single member LLCs and husband and wife owned LLCs and a 55 page Operating Agreement for multi-member LLCs. Provisions in the Operating Agreement needed as a result of the Bipartisan Budget Act of 2015, that modified the partnership audit rules applicable to LLCs. Addition of Partnership Representative provisions in our multi-member LLC Operating Agreement. These provisions replace the tax matters partner provisions required under prior law called TEFRA. Optional Service: Members digitally sign the Operating Agreement and are sent pdf copies of the digitally signed documents. See the contents of our Bronze, Silver and Gold LLC packages. To hire us to form an Arizona LLC follow one of the two options on our LLC formation page. 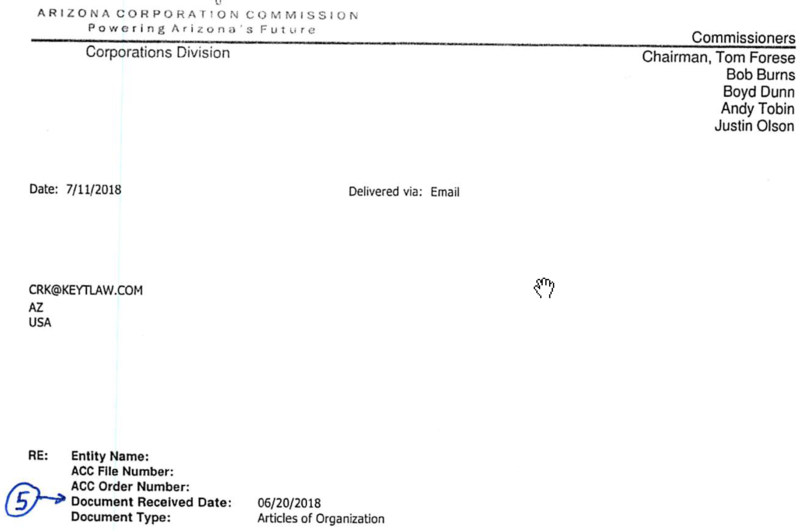 This is an example of why people should not use this document preparer to form an Arizona LLC. We always publish for every LLC we form. Publication is a requirement of Arizona LLC law. Notice the language that says the notice SHALL be published. Arizona LLC law, however, does not state the consequence of failing to publish the notice timely. A third party could argue to a court that the failure to satisfy the publication requirement of Section 29-635.C means the LLC was not legally formed and therefore does not exist. Because Arizona law is silent on the consequences of failing to publish, I recommend that LLCs that do not publish timely publish when they become aware of the fact the LLC did publish. Better late than never. Author’s Note: As of January 1, 2017, Arizona Revised Statutes Section 29-635.C was amended to eliminate the newspaper publication requirement for LLCs that have a place of business in Maricopa County or Pima County. On May 17, 2016, Arizona Governor Doug Ducey signed Arizona Legislature House Bill 2447. This new law is a tremendous victory for the people and a huge defeat for Arizona newspapers. HB 2447 eliminates the long standing rip off known as the publication of legal notices when corporations or limited liability companies are formed in Arizona. Unfortunately, publication was eliminated only for entities with known places of business in Maricopa or Pima counties. Beginning December 31, 2016, new Arizona LLCs and corporations with a known place of business in Maricopa and Pima Counties will not have to publish Articles of Incorporation (corporations) or Notices of Publication (LLCs) in a newspaper. Instead, the Arizona Corporation Commission will enter information about the newly formed entities into a database it is obligated to create. HB 2447 states that publication is eliminated only for entities that have a known place of business in a county that has a population greater than 800,000. Currently only Maricopa County and Pima County have populations that exceed 800,000. Entities that have known places of business in counties other than Maricopa and Pima must continue to donate money to the few Arizona Corporation Commission approved newspapers in the eleven counties with less than 800,000 people. Publication is a total rip off. For example, a few years ago we published Articles of Incorporation for a nonprofit corporation in a newspaper in a less populated county and it cost my client $600 after a 10% discount for the nonprofit corporation. Outrageous! Arizona House Bill 2303 signed into law by Governor Doug Ducey contains a significant change to Arizona’s securities laws. The new law allows the issuance of LLC membership interests to as many as ten LLC “organizers” to be exempt from Arizona securities laws. “sections 44‑1841 and 44‑1842, section 44‑1843.02, subsections B and C and sections 44‑3321 and 44‑3325 do not apply to any of the following classes of transactions: . . . This change in Arizona law is very important for every Arizona LLC that will issue membership interests that the securities regulators would designate as a security. If you think an LLC must issue stock to investors before it is considered issuing a security you are wrong. If the promoters of the LLC say to an investor give me your money for an X% membership interest in our LLC and the LLC will make a profit for you the LLC is issuing a security to the investor. This is an example of an “investment contract,” which is a type of security under federal and state securities laws. When securities laws apply to the issuance of membership interests in an LLC the LLC must comply with federal and applicable state securities laws or the promoters and the LLC become guarantors of the investors’ investments. Promoters who cause an LLC to issue membership interests that are securities the issuance of which does not comply with applicable securities laws will have substantial liability to the investors and to the securities regulators. To learn more about securities laws and how they can affect LLCs read the article my son and I wrote called “California LLCs & Securities Laws.” Although the article is about California LLCs, many of the concepts apply to Arizona LLCs. If your to be formed Arizona LLC will be issuing membership interests to people or entities that are investing substantial amounts of money to purchase their membership interests, you must have EVERY INVESTOR (without exception, but no more than ten) sign the Articles of Organization as an organizer so the LLC can claim the exemptions provided from Arizona securities laws by Section 44-1844.A.10. If you need your LLC to be able to use the ten exemptions provided in Arizona Revised Statutes Section 44-1844.A.10 hire us to form your LLC. Our Articles of Organization for LLCs that want to take advantage of Section Section 44-1844.A.10 contain special Section 44-1844.A.10 language. We send an email message to all LLC members notifying them that their LLC’s documents have been saved in the LLC’s ShareFile folder. When the member clicks on the link in the Welcome email the member is taken to a ShareFile page that tells the member ShareFile sent the member an email message that contains an access code. The member is asked to check his or her inbox, copy the access code in the follow up email and paste the access code on the ShareFile web page. When the member inserts the access code and clicks on the login button the member is taken to a secure web page on which the member enters a password, a confirmation of the password, first name and last name. When the member saves the information the member is taken to a ShareFile folder in which all of the LLC’s documents are saved in Adobe .pdf format. When logged in to the LLC’s ShareFile folder the member can: (1) download a document, (2) copy a document, (3) upload documents, and (4) share a file with another person. File transfer: ShareFile employs SSL/TLS protocols to protect client authentication, authorization and file transfers. High-grade encryption: ShareFile secures files in transit with no less than 128-bit encryption using industry-standard encryption protocols. File integrity: ShareFile employs a keyed hashed message authentication code (HMAC) to authenticate and ensure the integrity of intra-system communications. ShareFile verifies file size and file hash to ensure integrity. Link generation: ShareFile download links are uniquely and randomly generated using strong hash-based message authentication codes. ShareFile provides technical countermeasures to protect links from guessing attacks. Datacenters: ShareFile uses SSAE 16 Type II accredited or ISO 27001 certified datacenters to host the SaaS application and metadata. All files are stored in SSAE 16 Type II (SOC1), SOC2 and ISO 27001 accredited datacenters with high availability and durability ratings. Encryption: ShareFile stores client files at rest using AES 256-bit encryption, a Federal Information Processing Standards (FIPS) encryption algorithm. Firewalls: Files are processed using systems protected by securely configured firewalls that effectively limit and control access to network segments. Redundant storage: Files are stored in replicate with leading Infrastructure-as-a-Service (IaaS) providers that ensure high file durability and availability. We look forward to providing members of LLCs we form and clients with state of the art online document storage.